There is a growing obesity problem in America. Two-thirds of Americans are overweight, but that's not the real crisis: One-fifth of our dogs are fat. We discussed this expanding issue one afternoon at my parents' house. "He's just a couple pounds overweight." "Yes, and he's supposed to be a lap dog. He has at least four extra pounds on him. That's 1/5 of his body weight. Imagine carrying an extra 30 pounds around." "Yes, but we're talking about Tigger." 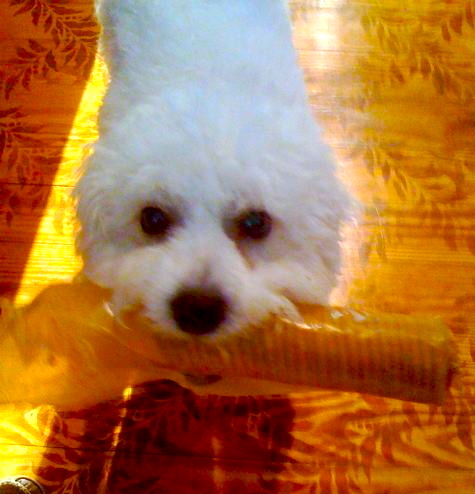 Tigger and his brother Sparky are white, fluffy Bichon Frises. There are several explanations for Tigger's current state. Our dogs are engaged in an ongoing territorial dispute. The larger and stronger Tigger licks the inside of his scrawny little brother's bowl, marking it as his own. Sparky is afraid to cross into kibble territory until Tigger has had his fill. Later, Sparky approaches the bowl to consume what's left of his allotted ration as if it were surrounded by land mines. Tigger has a remarkable ability to open kitchen drawers, climb into them and loot whatever is inside. This is an admirable accomplishment, given his size. I once came home to find him on the sofa in the TV room with an open bag of pretzels. He didn't share. Every time our furry little cinderblocks hear the rustling of Pepperidge Farm packaging, they bound over to the leather chair where my dad presides over "Cookie Time." The occasional "Cookie Time" would be okay if the three of them didn't consistently take down an entire bag of Milanos. "Cookie Time" is now the edible equivalent of Mad-Libs. There's also "Yogurt Time" and "Cheese and Cracker Time," and of course, last Sunday's "Pancake Time" which included butter and syrup in "small amounts." Tigger's sovereignty over all things snackable and our family's acquiescence has led us to where we are today. Our dog is fat. I weighed Tigger. 23 pounds. He should weigh about 19. Like thousands of other Americans, it was time for Tigger to go on a diet. I headed home to tell my mom we had to cut out "Cookie Time" for the pups. While we were at it, we should probably cut it out for Dad, too. She agreed. "What if we put him on Atkins? Just give him protein." "Mom, no. That diet's not even healthy for humans. Plus, if you ever give him a carb again, he'll blow up like a pool float." This may be the embodiment of a "First World Problem:" What diet do I put my animal on? Avoiding anything too dramatic, we try to cut down on snacks. A few weeks later we're back to "Cookie Time." I rant that sooner or later his paws are going to give out. He'll end up sliding along the floor like a seal. My mother looks at me as if I am the world's most hard-hearted soul. I'm not. I look into those puppy dog eyes and want to feed him everything in the kitchen. However, I can also see his recent slew-footedness and know that it's better for him to not be carrying around one more slice of cheese. "It's because I love you," I explain to his fluffy little soul, a plate in my lap. He doesn't understand. When tasked with baby-sitting the "gentlemen" for the weekend, I have our nightly "pupdate" phone call with my mom. "No, they had dog food." "But they wuv yogrit!" she says, in the world's most endearing puppy voice. We've missed out on millions not sending this woman into the voice-over industry. Mom spoke to me in the same voice in our earliest family home videos. The puppies are her new children. I can't blame her for indulging them. They are much cuter and never went through an awkward phase. Their ear and nose sizes have always been appropriate for their faces. While they have cleaned out kitchen cabinets and been caught breaking and entering, they have never talked back or kept their parents up at night with worry. It's difficult for any mom to find the balance between giving her kids what they want and doing what's best for them. We're still trying to find that balance. Mom now adds a garnish of salmon or string beans to the king's kibble instead of bacon bits. Tigger didn't notice the switch. Now that it's fall, daily walks have been incorporated into Tigger's schedule. "Cookie Time" still exists but only on special occasions. He's not quite ready to fit into his skinny jeans but we have an improved pup, already a pound or two lighter. He no longer has to get a running start to catapult himself onto the sofa. He's happier and, as a result, so are we. Dad's lost a couple pounds, too.